This week has been full of miracles! Never underestimate the power of prayer! We have been more specific in our prayers, and the Lord has blessed us for it! We found two new investigators and both of them are on date for baptism! Every time we meet with a new investigator for the first lesson, we always invite them to be baptized. 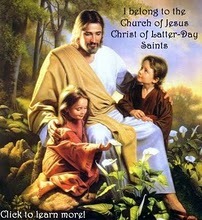 First we share the message of the Restoration, and invite them to be baptized when they know that our message is true. The first investigator, Carlos, is a friend to one of our recent converts,Tino, and was present when we were reviewing the restoration of the gospel with Tino. We got a call a couple of days later saying that Carlos had felt something at that lesson, and wants to be baptized! So we are teaching him now:) The second investigator is a former, but she's just been gone visiting her mother. So we invited her to come to church and be baptized in a month and all and she's excited for it! Golden, I tell you! Almost too good:) and we actually found out there is kind of an obstacle for her. She's not married to the guy she's living with. So. Now we also have a wedding to plan:) Hopefully all will go well with that! We also had a fireside with the members in our ward. Only people from Kearny came though! Probably because we made it a point to call the people in our area and inform them of it. They all have family mission plans and we are going to follow up on them and hopefully be able to get some more referrals!! The work is moving forward, and this area is booming! The Lord has blessed us so much! Something interesting about the streets around here, is that the speed limit is always 25 mph. So when I went on an exchange, we were driving on a 40 road, and I was like, whoa I'm going too fast! Then I just thought about 90th that's right in front of our neighborhood. Good ol' New Jersey!